There will be 16,000 police officers on the streets of London tonight. Cameron warned that “if you are old enough to commit these crimes, you are old enough to face punishment”. UK PRIME MINISTER David Cameron has sent out a strong message to those involved with the recent violence in London and other cities. Coming straight from a committee meeting which involved the Metropolitan Police Service commissioner and the Home Secretary, discussing the action they will be taking to help the police deal with the disorder, he said it had been decided that there would be 16,000 police on the streets of London tonight. He said that he completely condemned the violence and that people “should be in no doubt that we will do everything needed to restore order to Britain’s streets and make them safe for the law-abiding”. The Metropolitan Police Service has put CCTV images on its Flickr account and is asking for the public’s help in identifying those pictured. Cameron described the looting and vandalising as “sickening scenes” and said it was “criminality pure and simple and it has to be confronted and defeated”. He extended his sympathies to all affected by the violence and those who live in fear because of the appalling scenes. The police, said Cameron, “showed incredible bravery in confronting thugs” but more police are needed. The amount of police will go from 6,000 last night to 16,000 on the street tonight. Aid will come from police forces up and down the country. A strong message was given that court procedures and processes will be speeded up to bring culprits to justice and people are to expect to see “more, many more arrests in the days to come”. He said he was determined that justice will be done and these people will see the consequence of their actions. You will feel the force of the law and if you are old enough to commit these crimes, you are old enough to face the punishment. You are not only wrecking the lives of others, not only wrecking your own community, you are potentially wrecking your own life too. British Parliament will be recalled for a day on Thursday. Chris Sims, Chief Constable of the West Midlands Police, said that “last night was a really terrible night for the country and Birmingham”, when “all sorts of behaviour from the country were imported into the West Midlands”. This involved “wanton theft, damage and disorder” and was targeted on electrical goods and high value clothing. “A lot of the people were astonishingly young,” said chief constable Sims. “This was not an angry crowd, this was a greedy crowd,” he said. There were about 7 – 800 people at the height of the violence in the city centre, and around 400 officers in protected equipment and other members of the force. At least 30 premises were damaged orhad goods stolen, and a police station was burnt. The city is open for business this morning. There were 133 arrests and clothing was recovered. Pictures from CCTV footage of people involved will be put on the force’s website. 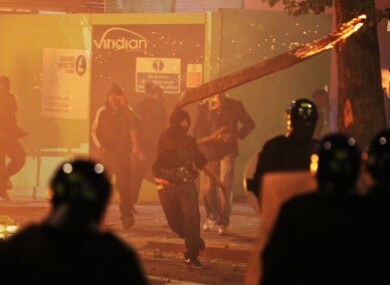 Email “PM David Cameron: Rioters will feel the full force of the law ”. Feedback on “PM David Cameron: Rioters will feel the full force of the law ”.